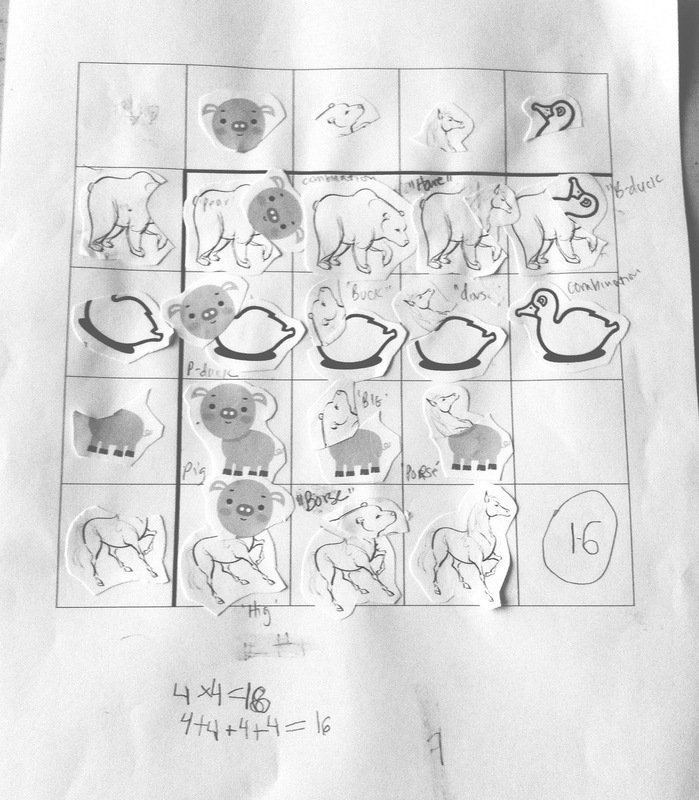 The Map is Not the Territory: Critter Combinations: Grids, Arrays, Multiplication & More! Critter Combinations: Grids, Arrays, Multiplication & More! When I was in third grade I learned multiplication. Well, really, it's more like I memorized the facts. I learned about fractions too, but I never really understood them...at all. To this day, I have only a cursory understanding of ratios and percentages. I have higher hopes for my seven year old daughter, though, especially now that I know all of these subjects are related. My daughter and I have explored a lot of different aspects of math over the last year (mental math, sums and differences, lots and lots of geometry, fractals in various forms, mathematical stars, flexagons, functions...). It's been great and we're still going to keep exploring the beauty and structure of patterns wherever and whenever they come up. But, I recently came to the decision that though it might be a challenge for both of us, multiplication was next. And I knew that my focus, for now, was not going to be about facts or memorization, it was going to be about comprehension. My daughter has basically understood the groupings concept of multiplication for a while now, well before she mastered addition and subtraction. It's of the 'cookies on the plate' variety, except for one of my favorite lessons using multiples of threes to make stars. Fortunately, I recently found a great card game from Let's Play Math (a free download, which I wrote about here) that helped me introduce the idea of multiplication as a number sentence, arrays, groupings, and measurement. We've also started playing with this Primitives Application (which is really more about factoring, but for the elementary mathematician the visual groupings can't be beat). I first found out about the primitives app from Maria Droujkova of Natural Math. 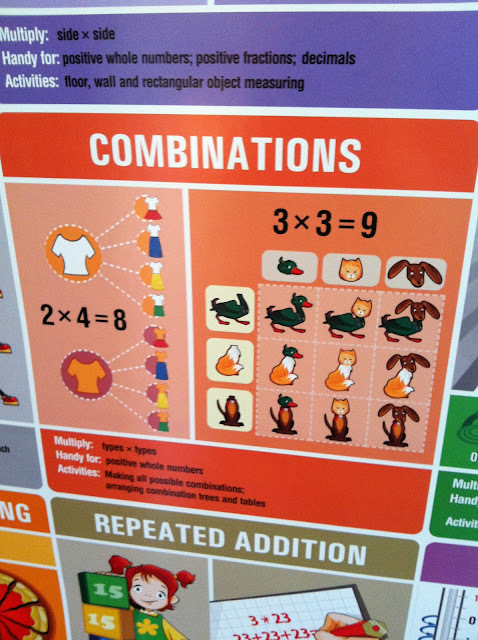 And, I recently purchased and hung Natural Math's Multiplication Models poster in a prominent place just so I can ponder all the wonderful information in it. If my kid gravitates toward it, all the better. I was pointing it out to my daughter -- "Look, a cat-dog! Let's call it a cog!" I was having fun coming up with silly names for each combination and that's when it hit me. I was actually understanding the process of combining something other than dance steps. Then I thought: Grids. Arrays. Multiplication. Perfect. Let's make our own! I made a quick grid that night and upped the combinations to 4x4. I asked my daughter what animals she'd like and found some clip art that worked. The next morning I ran into a roadblock. The kid was not happy about cutting up all the animals in to heads and bodies. Not. At. All. I quickly changed that to 'tops' and 'bottoms' hoping for a less gruesome association to only partial success (she covered her eyes every time I cut an animal in two). To insure that this activity didn't drag on, I did most of the cutting and pasting. I suppose it would make a good fine motor activity, but I wanted her to focus on the combining rather than the preparation. We started with the pig 'top' and bear 'bottom' (hee hee) and called that one a 'Pear' and continued haphazardly from there. In retrospect, I wish we had moved left to right and top to bottom on the grid, pasting parts and making up the names from there. Giving them combination names was a good challenge but if I had another chance to do this again I would formalize the naming process by using the animal top to blend in with the animal bottom or vice versa. You can't name a pig top/horse bottom the same as a horse top/pig bottom, right? They're different creatures altogether. So, for example, Pig/Bear would be "Pear" and Bear/Pig might be "Big". Although I wish we had filled in the grid in a more organized manner, it also did work out the way we did it, too. I'd ask, what combination do you want to do now? She'd choose and then I'd ask her to find the square where that combo animal had to go on the grid. She didn't quite get it at first, but after a few combinations she had the hang of it. At the end I guided her through counting the rows and columns and finding the total number of combinations we had made. I also focused on writing the answer in two different number sentences, as multiplication and again as repeated addition. By the end, I realized just how dense this kind of activity is. If I do it again, I'd plan for a large grid (maybe 6x6?) but I'd have us combine three animal tops and bottoms to start with. Depending on the kid, you can add one or two more animals to the mix or even just (aha!) predict how many more combinations you would have with the addition of each new animal. And, then you can make a connection to square numbers. Cool! Okay, I'm revising the list of math activity/topics in this post: growing patterns (algebra), square numbers, grids, arrays, multiplication, and combinations. When your students are done with this deceptively simple activity give them a big pat on the back and then take them out for ice cream. I also owe my daughter a big thank you for being a fairly willing guinea pig on what turned out to be a very tired day for her. If you want another similar and super fun grid/combinations activity check out this great post from Yelena at Moebius Noodles called Mr. Potato Head is Good at Math. It's fantastic. And, don't forget to check out all the fun we're having over at the Math in Your Feet Facebook page! Today we found the math in an incredible flower from Argentina! When your students are done with this deceptively simple activity give them a big pat on the back and then take them out for ice cream.